We’re open daily from 9am to 5pm - including weekends and public holidays. Bookings are not required for general admission, or to join our daily tours which are included in your ticket price. We open of an evening for visitors who have booked one of our nighttime experiences - The Bonorong Night tour or Private, Premium Night Tour. You’re welcome to BYO food or a picnic - we have a number of picnic tables throughout the Sanctuary, and do take bookings for our BBQ area. We simply ask that you do not share your ‘human’ food with our animals, as this can result in serious illness. The Bonorong Food Hut serves 100% plant-based, delicious food during the day. Enquiries for catering (for large groups) and pre-orders (for small groups) are welcome. The food hut is generally open from 10.30am til 2.30pm - but this will vary during winter. Please call ahead if you want to be sure it is open for your visit! There's plenty to see at Bonorong - and our path is one big loop, so you won't miss a thing. Note: if you have a GPS, you can enter "593 Briggs Road, Brighton, Tasmania, 7030" to generate accurate directions from your current location. Follow the A1 (the main highway between Launceston and Hobart), south towards Hobart. The journey from Launceston to Bonorong will take about 2 hours. After approximately 170km, you will pass through the town of Mangalore, then come to a large roundabout. Take the first exit at the roundabout to stay on the A1 highway. As you continue along the highway you will see large information signs indicating an exit to Tea Tree Rd/C321 (and also signs for Bonorong). Take this exit off the highway. At the intersection, turn right and continue along for approximately 1km until you see a small Bonorong sign directing you to turn left on to Briggs Rd. Continue along Briggs Rd, passing over the train tracks, until you see Bonorong Wildlife Sanctuary on the left hand side. Turn into the driveway and up to the main carpark. You've arrived! Take the A1 (the main highway between Hobart and Launceston) north out of the Hobart city centre. When you reach Granton, take the second exit (turning right) at the roundabout and cross over Bridgewater Bridge. Continue straight through the roundabout immediately after the bridge (past the fast food restaurant on the left). At the next roundabout, take the first exit to turn on to the Brighton Bypass. Drive for 3-5 minutes, keeping an eye out for the large sign on the left hand sign reading "Bonorong Wildlife Centre". Take the first exit after you see this sign, staying in the left lane. At the T intersection, turn left, following the Bonorong sign. Note: this is now a 60km an hour zone. Follow this road around the bend - you will soon see Briggs Road on your left, with a small sign for 'Bonorong Wildlife Park'. Turn left onto Briggs Road. Bonorong is approximately 1 kilometre up this road on the left hand side (past the train tracks). Take the driveway up to the main carpark. You've arrived! Taxis to and from the Sanctuary are readily available and often appreciate the large fare. Uber is readily available in the Hobart CBD, however you may not be able to find a local Uber car in the Sanctuary area. We recommend not relying on Uber for transport home. Public transport to and from the Sanctuary is currently not readily available. Please use the MetroTas trip planner to see the best possible route via bus. 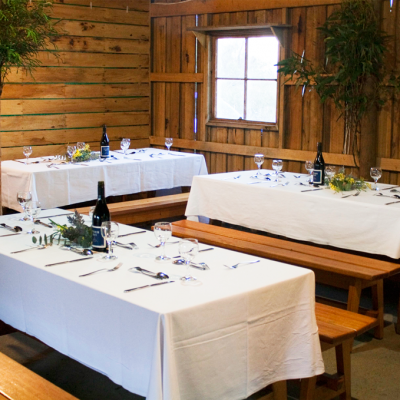 Bonorong is able to host private functions and events in the ‘Bush Tucker Shed’. This space includes a kitchenette, indoor dining area, and a BBQ on the veranda to cater for both formal and informal functions. Fees are calculated depending on the use of the space. Contact us to find out how to book this area. We accept cash, EFTPOS, credit and debit cards on site – but do not have an ATM or any ‘cash out’ facilities. We love Tasmanian weather – most days anyway! But remember, the day can change quickly because of our island climate. We recommend all visitors prepare for both heat and downpour when they visit us! Wear comfortable, closed shoes and bring a raincoat – even if it is sunny. Visitors might be surprised to learn that Hobart, with an average of 626 millimetres (24 inches) is Australia’s second-driest capital city (after Adelaide). To find out more about Tasmania’s weather, check out the Australian Bureau of Meteorology. Bonorong Wildlife Sanctuary is a 5 minute drive from the Brighton town centre, which has a number of casual dining options including a bakery, takeaway store and a small cafe. You'll also find a small supermarket, petrol stations, a chemist and a post office. Richmond - 15 minutes away - has a few more options, including some fine dining establishments. Hobart city is only 30 minutes away with a full range of dining options and facilities. The nearest caravan/RV park is in the neighbouring town of Pontville.